The freedom gift card is the perfect gift for any occasion: birthdays, weddings, anniversaries, housewarming, or as a unique way to say thank you to your supplier, valued staff, friends and family. 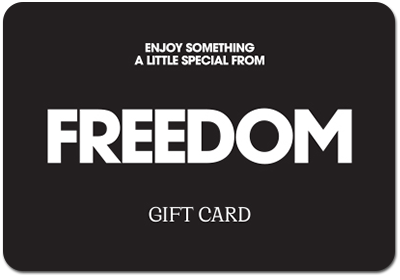 Gift Card is redeemable for purchases at freedom stores in Australia only. Gift cards with a PIN can be redeemed online, however only three (3) gift cards can be redeemed per transaction to a maximum value of $1,000. Gift Card is not redeemable for cash. No change will be given and any balance that remains on the card can only be used in whole or part against future purchases at freedom stores. It is up to the cardholder to use the full value of the card before the expiry date. Any unused balance will not be refunded or credited when the card expires. Where the cost of the purchases exceeds the available card balance, the cardholder will be required to make up the difference between the purchase price and the Gift Card balance. Gift Card will expire on the expiry date. Gift Card cannot be replaced if lost, stolen or damaged. Gift Card cannot be redeemed for purchases made at freedom kitchens, freedom excess or freedom gift fund.